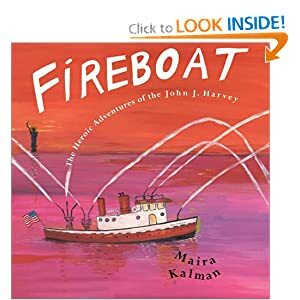 One is called Fireboat: The Heroic Adventures of the John J. Harvey. This story recounts how an antique fireboat was preserved and restored by a group of friends and then called back into active duty on the night of 9/11. One of the boys picked it up purely “by accident” on a trip to the library and a happy accident it turned out to be! It’s an engaging story and the illustrations are bright and beautiful. The second book is The Man Who Walked Between the Towers. 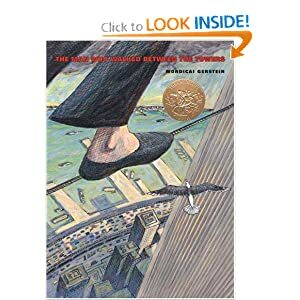 This Caldecott medal winner tells the tale of Philippe Petit’s tightrope walk in 1974. It’s always shocking to the children that this actually happened! The twin towers were awe-inspiring structures, and this tale relates that emotion. 9/11 is more of an afterthought in this book — but I always choke up when I get to the page that says, “Now, the towers are gone.” The accompanying page shows the NYC skyline without the World Trade Towers. What do you do in your home to mark the anniversary of 9/11? This entry was posted in kids, links, reading. Bookmark the permalink. Thanks for remembering – so they will remember too.As a people we don't remember well any more. My Jonathan remembers. He watched with me on TV – I just couldn't turn it off. It was the very first day of teaching art class and so I didn't know anything until the class was over. A couple of the Mom's came in my home after the children went out to play and sat me down at my table to tell me. I will never forget the look on their faces and I knew someone had died, just not how many.I have not read that book, The Man Who Walked Between the Towers, but I did watch the documentary movie about him. It was worthwhile for adults. Ask Bonnie Buckingham about her children break spontaneously into singing a hymn – King Alfred's War Song as they watched. If you know the words to that song, it still gives me chills to imagine.Great post, Kelly. I second the "documentary" tribute to Philippe Petit – he was a strange bird, but it's an interesting film. I think it's called Man on Wire?9/11 means many things to me, having lived in the ME during the attack and now living so close to NYC. But a special, seemingly unrelated event occurred on September 11, 2008 – the birth of a little girl in Kenya who was abandoned by her mother, later to be named, so fittingly – Hope. Her adoption is still in the works and we don't know what the future holds for her, except that God has a special plan for her! Somehow her name and her unique life seem to redeem the date of September 11th in some small way for me. And then I went and got married on September 12th! I put Fireboat on hold at our library; thanks for the suggestion, Kelly. We read The Man Who Walked… today and all the girls were riveted. We saw some youtube clips and the girls were shocked.To remember, we donate to the National Fallen Firefighters Foundation in honor of the firefighters who gave their lives for others. The kids can donate anything from $1 on up.